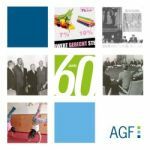 The AGF regularly organizes national and international conferences, meetings and discussions on well chosen, current political questions in collaboration with its member organisations. These events create an opportunity for the exchange of opinions, the formulation of political requirements and the development of effective implementation strategies. What is digitalisation doing with families? AGF invites to a panel discussion on the impact of digitalisation on families. We will discuss questions that often arise in families such as: What conflicts may arise in families? What is the best framework for families to profit from best from digitalisation and what should be done? Parents and professionals often have different perspectives and solutions on these questions. We will discuss this on a panel discussion in Berlin, Germany on 10 October 2018. The discussion will be in German. The global population is growing continuously and, at the same time, a growing percentage of it chooses to live in urban areas. Cities are meant to be centres of high technology, globalisation hubs and of socio-economic opportunities. People in Germany, as well as in African, Asian and Latin American countries are attracted by large cities such as Berlin, Lagos, Tokio, Mumbai and Sao Paulo. Small and medium sized cities are popular as well. Therefore the conference will tackle these questions: How can we built a sustainable and worth living future for people both in urban and rural areas? What are the major recommendations on the sustainable development in municipalities? What are the main challenges resulting therefrom for politics? Along those questions we will discuss conflict lines, innovative approaches and the scope for action for politics and civil society. The conference mainly adresses a German audience. However, the keynotes as well as the following discussion will be translated (German/English) and many of the speakers and particpants will be English speaking. If there will be a sufficiant number of English speaking particpants, it will be possible to also have translation available in the workshops and final panel discussion. Last year, the European Commission has published its proposal for a directive on work-life balance for parents and carers with concrete measures regarding, inter alia, family related leave schemes and flexible working arrangements. If finally a directive is agreed on, this may have direct impact on national legislation, since the Member States are obliged to implement the directive into national law. In the meeting, we want to address the state of play and the next steps regarding the WLB package, exchange views on measures proposed and on the national debates about it, but also talk about what the implementation of the WLB-measures would mean for the respective countries. Speakers will come from the European Commission, from the German Family Ministry, from COFACE-Families Europe and from different Member States. The conference has focused the digital changes of work from the family perspective. Which digital changes are especially relevant for families? How can they use the digitalisation of work processes for their interests and needs? We had looked for answers in three topics: digital changes' effects on social security for women and men, the possibilities for more flexibility in working time and space for employees and the effects of digitalisation in the care sector. European Expert Meeting: Growing up digital - How can we make the internet safe for children and young people? The meeting focussed on digitalisation and the childrens' use of the internet, which has become a vital part of their every day life throughout Europe. It offers many chances, but also bears risks for children and young people, for example regarding inappropriate content or data security. Therefore, we looked at what has already been done to make the internet a safer place for children, especially at EU Level but also in some Member States (Estonia, Denmark and Germany). Finally, the meeting tried to figure out which additional measures are needed and which key players have to be involved. Please find the presentations released for publishing on our website below. What does it need to make the internet a safer place for children? 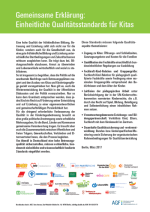 17 November 2016, Berlin: How to achieve a just subsistence level for children? AGF invited to a discussion with Prof. Dr. Anne Lenze und Prof. Dr. Joachim Wieland on reforms of meeting the subsistence minimum of a child. 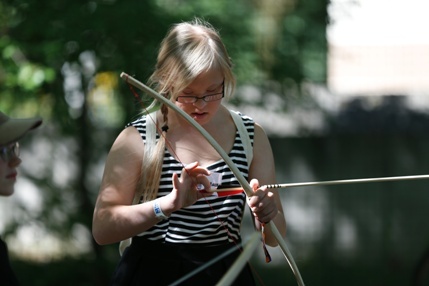 The system of meeting the subsistence minimum of a child in Germany has been criticized for a long time: The combination of a child benefit and a tax free child allowance is incomprehensible to many and leads to social inequalities. Currently, the amount granted increases with the family’s income, enlarging the social gap between families. Furthermore, the amount of the subsistence minimum granted differs between social, fiscal and maintenance law and its overall level is also criticized as too low. The discussion on 17 November was based on the problems of the current system and aimed to identify possible reform measures to ensure an adequate subsistence minimum of each child. Prof. Dr. Anne Lenze und Prof. Dr. Joachim Wieland presented their ideas for reforms, their political feasibility and took a position on important key questions. 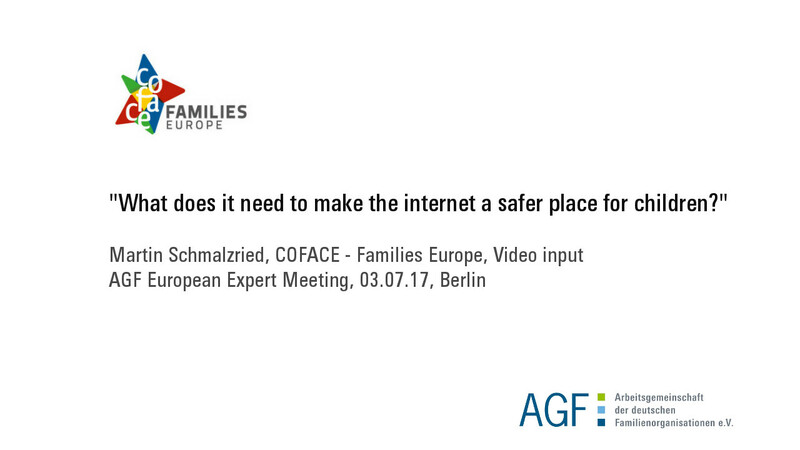 COFACE - Families Europe and AGF are jointly organising the conference 'The impact of digitalisation on 21st century families' on 7-8 November in Berlin. Experts and stakeholders will get together to discuss this topic, aiming to stimulate debate, put some practical examples out there, and take a peek at what the future will bring. Online registration: http://digitalfamilieseu.eventbrite.co.uk. Payment via Credit Card. Registration form of AGF (German) per FAX: ++49 30 290282589 or registration@ag-familie.de. Payment of fee via bank transfer to the bank account given on the confirmation email. In nearly all European states the question needs to be answered how a subsistence minimum for children and families can be secured by the social system. In general, this is an important topic for families and family politics, particularly because the definition and the system of a subsistence minimum for children and families have a major impact on other social standards as well (in social, fiscal and maintenance law). How much do children and their families need for a decent life? AGF invited to a conference on quality child care. We discussed what good quality in early childhood means, how it can be defined and it can be accomplished. 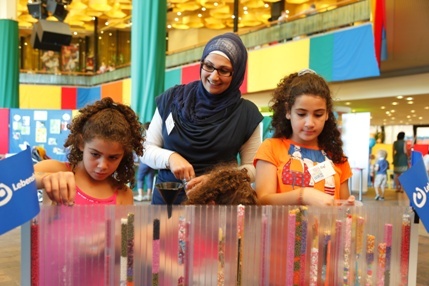 Experts of different professions discussed on topics that put Time and Family in their center. They approached this by the different views of policy, social work, therapy and law. Keynotes and photos of the conference can be seen on this website and on the website of ICCFR. Documentaiton, keynotes and photos of the conference can be found here. Experts from sciences, politics and organisations from different European countries discussed at the expert meeting, what good quality in early childhood education and care means and how it can be achieved. Therefore, the experiences and current developments in Finland, Scotland and Germany were presented and added by examples how to deal with ethnic diversity and of the current situation in eastern Europe. The central issue was whether a so-called family time policy, as recommended in Germany, is discussed in other European countries too. Please find below the documentation of the meeting and the presentations of the experts invited. For pictures of the expert meeting please click here. 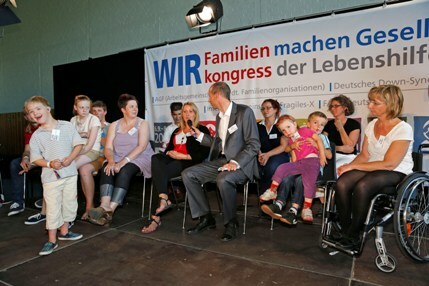 On the publication "#FamiliesVOTE2014 - Helping you make your choice for the 2014 European Parliament Elections" was launched in Berlin. A debate focused on what the European parties/groups have to say to family related topics. The event was co-organised by COFACE, Eurofound AGF, with the participation of students, volunteers, bloggers, civil society representatives and journalists. In three workshops, the participants discussed what changes are necessary to allow families more flexible time arrangements and how appropriate legal measures should be designed to ease the reconciliation of work and family life for both, mothers and fathers. Event for all families on in Berlin. Conference, speeches etc. have been in German. The focus laid on the growing problems for families at the housing markets in the EU Member States, especially in urban areas. Please find below the dokumentation and some presentations of the experts invited. Children, Care and Professional Life - what does families help to overcome time pressure? The conference refered to the currently published 8th Family Report. The Right to Family Reunification – The European Directive and national implementation in the current discussion. Since 2003, common EU-rules on the right to family reunification of third-country nationals living in the EU have been installed. A European directive defines the conditions of entry and residence for non-EU family members joining a non-EU citizen already legally residing in a Member State. Besides, in some Member States (e.g. Germany) these rules also concern national citizens who have chosen a partner from outside the EU. Only the right to family reunification gives them the chance for a normal family life as it is habitual for most families in Germany and Europe. However, these regulations may also include rather strong obstacles. Documentation of the conference: Child Poverty in Germany and Europe -Where are we at the End of the European Year for Combating Poverty and Social Exclusion? Conference by AGF and European Commission Representation in Germany on child poverty. In the European Symposium over the course of two days European experts discussed the issue of child poverty in the European Academy in Berlin. The contributions of the speakers as well as a summary of the discussions can be found in the detailed documentation. Children need Future – for an Europe without Poverty! The event was directed at representatives of family-political and child-political organizations as well as at well-known scientists and academics from the European member states. In focus was the exchange of ideas and exchange of experience among the masses, the causes and the results of child poverty in the European member states as well as the search for common suggestions on solutions. The results of poverty appear with children in nearly all areas of their life: Poverty leads to disadvantages in educational opportunities, to poorer health, to social exclusion and to damaged self-confidence. This conference placed the main focus on the institutions concerned with child poverty and structures in Germany. As well as this, the question as to how the present political and institutional structures themselves contribute to the solidification of this poverty was posed. The demographic development in almost all European countries is one of the biggest challenges for the member states of the EU. 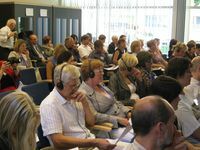 In the conference of the German national committee (DNK) of the world Family Organization the relevant subject complexes were consolidated in collaboration with the AGF: Those including relations between the generations, mutual and lifelong learning as well as support of the families for the protection of a united community. 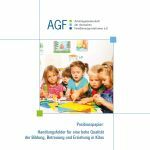 The documentation "Meeting Place Europe" (in German) can be ordered from the office of the AGF. Today education moves between extremes in which parents must position themselves. Hence, it is connected, now more than ever, with an especially high degree of self-reflection and information. The Family-appropriate Tax Revision - which Tax Policy do families need? The discussion on family incentives and the distribution of burden in Germany stood at the forefront of this symposium. As well as the elaboration on the current state of affairs, the history of the development of these achievements was examined and the overall view was directed past the national state of affairs to include that of the European neighbours. Thus it was clarified which family incentive schemes other European countries use and which alternative models could perhaps also be relevant for Germany. What has changed for families after the international year of the family in 1994? Which quantitative and qualitative results can be recognised? This stock-taking on the current situation of families was supplemented with the search for perspectives for a European family policy. The Seventh Family Report - Questions and Suggestions on the Issue of "Child-conditioned Poverty"
This discussion with members of the expert's committee on the seventh family report 'Future of the Family - Social Changes and Social Cohesion‘ enabled the AGF to draw attention to important family political necessities, in the run up to the report. The issue of 'child-conditioned poverty' was the main focus of the discussions. What Children need- What do Children need? At the centre of this discussion was the social educational responsibility for children. Against the background of the other consequences from PISA - as well as the IGLU study, the seminar discussed particularly which educational and care concepts appropriate for children, are necessary and also from the children’s‘ perspectives, how and which collaborations between families and educational institutions should be formed. In this professional discussion with various topical studies on the education of children and young people main focuses were established for further work, and educational policy requirements were composed. The collaboration with and for families was at the forefront, with the purpose of strengthening and further supporting the education and up bringing responsibility of the family.